Mornings are hectic and sometimes stressful as you get ready for work and prepare your kids for school. Add to that a late bus, or a bus that’s so early you don’t even realize it’s come and gone. Are you tired of wondering when the school bus is going to arrive? 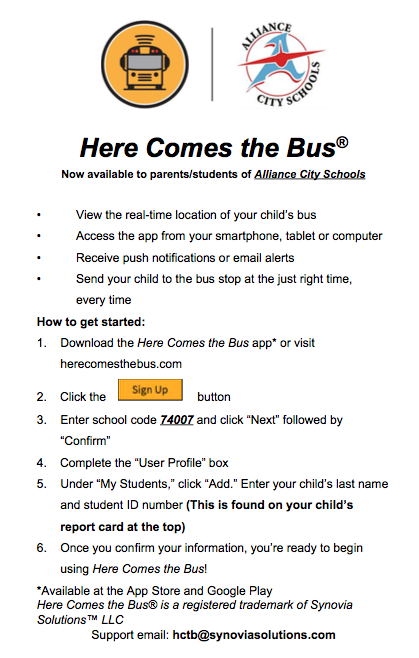 Here Comes the Bus® is a school bus tracking app that is revolutionizing morning routines for parents and students by giving them real-time bus location and alerts to get them to the bus stop on time. No more standing in the freezing cold or pouring rain, wondering where the bus is and when it will arrive. And no more being late for or missing the bus all-together. Click on the image below for more information about signing up!